Hill's prescription Diet w/d Canine Mini is clinical nutrition especially formulated to support your dog's weight management. Hill's Prescription Diet w/d Canine Mini is a complete and balanced food that provides all the nutrition your dog needs. It is recommended for weight maintenance after weight loss, fibre-responsive conditions (diabetes mellitus, hyperlipidaemia, colitis and constipation), hyperlipidaemia and struvite urolithiasis reduction in obesity prone dogs. 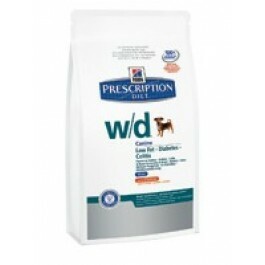 Hill's Prescription Diet w/d Canine is also appropriate for adult dogs that are less active or neutered. Reduced energy and fat - helps avoid weight gain and helps lower lipid levels. Increased total dietary fibre - provides increased dietary bulk which helps reduce satiety and reduce hunger. In dogs with diabetes mellitus, it helps minimise blood glucose fluctuation, which may help reduce insulin dose. In the cases of colitis and constipation, it modifies bowel transit time and helps increse intestinal motility. Supplemented L-carnitine - facilitates conversion of fat to energy and helps maintain lean body mass. Reduced magnesium, phosphorus and protein - decreases urinary concentration of struvite constituents, magnesium, ammonium (from protein) and phosphate. Maintains acid pH 6.2-6.4 - discourages the formation and aggregation of struvite crystals. Superior antioxidant formula - neutralises free radicals. Maize, cellulose, chicken (16%) and turkey meal, maize gluten meal, pea bran meal, digest, dried beet pulp, animal fat, flaxseed, vegetable oil, L-lysine hydrochloride, L-carnitine, brewer's rice, taurine, L-tryptophan, vitamins, trace elements and beta carotene. With natural antioxidant (mixed tocopherols). 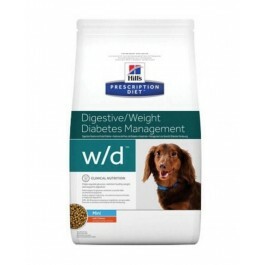 Hill's Prescription Diet w/d Canine Mini should be recommended by your veterinary surgeon. For detailed information on feeding amounts and how this food can help your pet, please consult your veterinary surgeon. Exclusively feed the recommended Prescription Diet food and keep fresh water available at all times. These ranges are a starting point only because dogs' needs vary. Adjust the feeding amount to maintain the optimal body weight. Hill's Prescription Diet w/d Feline is especially formulated to support your cat's weight management, as well as cats with fibre responsive conditions.